Use Pardot? Use Wistia? Want to meld them together to execute a video-driven marketing automation strategy the likes of which this world has never seen? You’re in the right place, friend. Haven’t signed up for the integration yet? Sound fun? That’s because it is fun. And it’s easy! This page will give you everything you need to get started and be successful. In Wistia, head to Account Settings and navigate to the Integrations section under Advanced. Scroll down to Marketing Automation integrations. Enter the credentials you use to login to Pardot, along with your Pardot API User Key (which you can find in your Pardot settings). Check the "Show Video Play Heatmaps" box, and then fill in your API Password and Public Token from Wistia. Here’s a guide on how to find those. Then save the connector, and do . Read on for details about what you can do with your newfound powers. With Turnstile, you can ask people to enter their names and email addresses at any point in your videos. 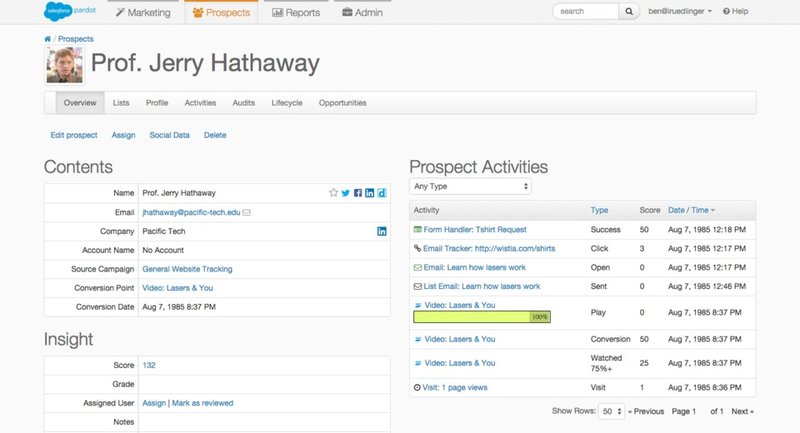 And now that you have Wistia connected to Pardot, that information will automatically create a new Prospect record in your Pardot Account. Woo! “Hold on, Wistia. What if the person is already an existing visitor in Pardot” you ask? Good question! In that case, we’ll convert the existing record in Pardot from an anonymous Visitor to a known Prospect. If that was your video, you’d be generating new leads right this very moment. So go ahead and embed your own video to get started! You can find Turnstile in the Timeline Actions section of the Customize panel. Here’s a handy blog post by Ezra about how to use Turnstile most effectively: Collect More Emails With Video. With the Wistia Connector enabled in Pardot, data about how every person watches the videos on your website will feed directly into your Pardot account. 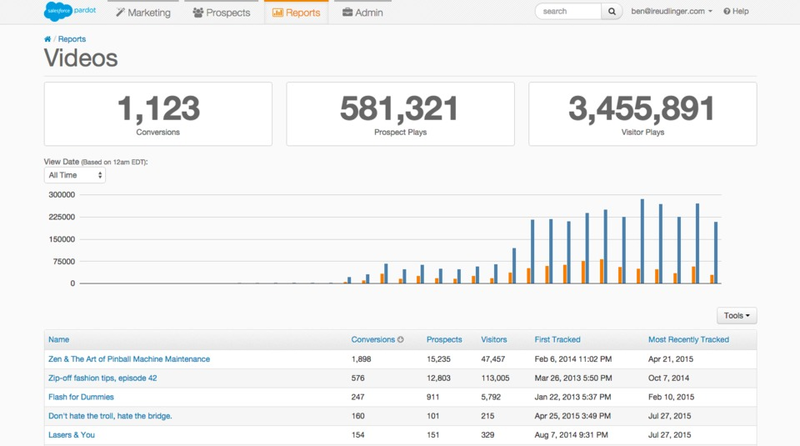 Know that Email report in Pardot, where you can track the performance of all your email campaigns? Well, now you’ve got a report just like that one, but for all of your embedded Wistia videos. 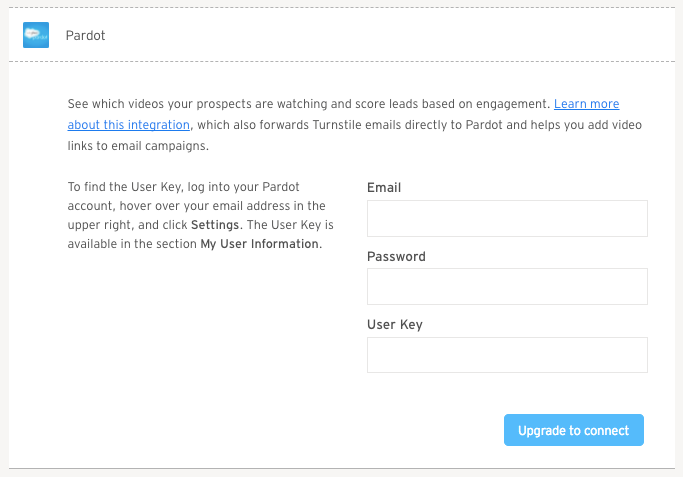 From the Video report (see above 👆), you can add all the prospects who watched a certain video to a list in your Pardot account. You can also give them all tags if you’d like. Or heck, do both! From there just choose what you’d like to do with the prospects who watched your video, and let Pardot work its magic. 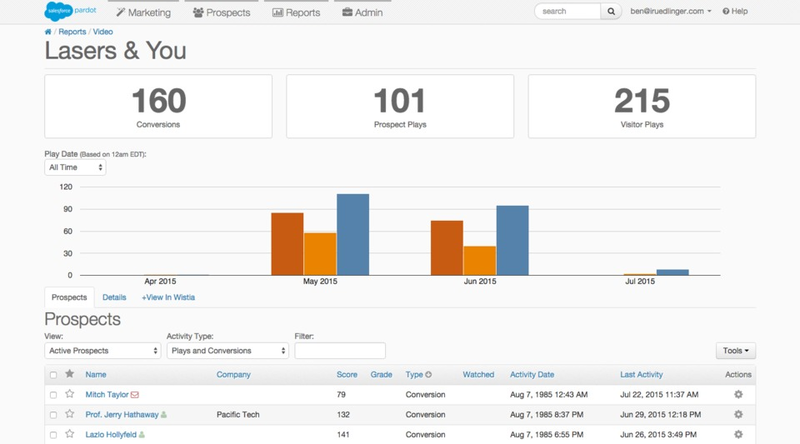 Want to adjust prospect scores based on video data? Me too. Let’s do this. Video Play: Simply, the person began playing a video. Video Watched 75%+: The person watched at least 75% of the video. Video Conversion: The person entered their contact information into Turnstile on the video. Email is a great way to nurture leads and stay engaged with your growing audience. Then add a little video to the mix, stir in some tracking and analytics, and baby, you got a stew goin'! Open the video’s page in your Wistia account. Click on the Video Actions menu, and choose Embed & Share. On the Link In Email Campaign tab, select Pardot as your email provider. Adjust the thumbnail image size and choose the URL where you want people to watch the video. It can be the video’s page in your Wistia account, or anywhere you have it embedded. Copy the Email Merge Tag from Wistia and paste it into your email in Pardot. Fun fact: When people receive your email and click through to watch the video, their email addresses will automatically pass through to the Wistia stats. Learn more about video+email marketing with Wistia. 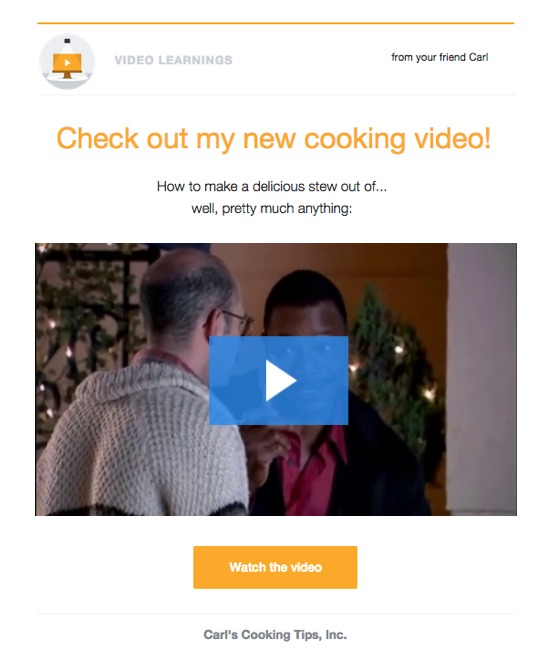 Get some fancy (and free) video-centric email design templates. First things first, it’s important to know that only videos embedded on your website will show activity in your Pardot account. When a person watches a video from the video’s page in your Wistia account, that activity will not appear in Pardot. If the video _is_ embedded on your website but it’s still not showing activity in Pardot, make sure that you have Pardot’s tracking code on the page, and that your Wistia embed code has the wistia_embed class (as it should by default). Followed the steps in this section but you’re getting an error message? Check to see if you have Pardot’s IP Location Activation option enabled. If you do, you’ll need to disable that in order to use the integration. Your problem isn’t covered there 👆 ? If you’re still having trouble, our Customer Happiness team is here to help: Contact Us.